WazzapMigrator for Android helps to transfers WhatsApp history from iPhone to Android. You don’t have to worry about all the data present in your WhatsApp when you want to change your phone from an iPhone to Android. It could be just text, images or video, your brand new Android will have it all and get you connected quickly with all your contacts. 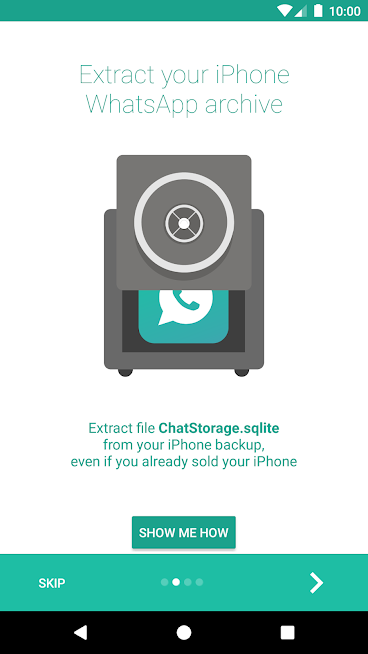 Messages, emojis, images, audio, locations, contacts, documents and video can be imported with ease. The app works fine even when you have lost or sold your old phone. WazzapMigrator is designed to work with any model be it old or new. It is quite complex to transfer data from an iPhone to Android and issues will erupt at difference in versions and file types. The app is designed to handle these issues. Any content or media files, including audio, photos, videos and complex gps files and documents can be transferred. You need to ensure that you have an iTunes and an Apple account. Connect the iOS device to the computer using a USB cable. The WazzapMigrator app needs to be installed to computer through its website. Once the app is installed, open it and select the iOS device from which the files need to be retrieved. Click the export button and export all the files to the respective folders in the app, next, connect the Android device to the computer using the USB device. Open the file explorer of the Android device on the computer and drag the exported files onto the download folder of the Android device. WazzapMigrator is secure and takes care of the privacy of your data. It is indeed an exciting feeling to own a new phone but a daunting task to move all your data from the old to new phone. WazzapMigrator makes this task quite simple. This data transfer tool helps you ease out the usual issues faced under this circumstances and makes the entire process a breeze. The app costs $6.99 to download and use.